Every major event should open with a star-studded gala, and The New York City Food and Wine Festival celebrated its fifth year launch last night with an inaugural ball... a meat-ball. 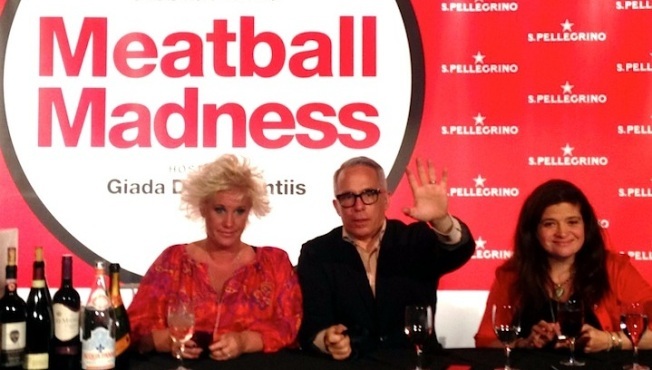 Meatball Madness, hosted by Giada De Laurentiis, consumed 82 Mercer which held a sold-out crowd as they sampled meatballs from some 37 chefs. The perfect amuse-bouche and ball jokes and puns abound, some of New York’s finest and most celebrated meatball connoisseurs were shelling out these delectable round creations all night long. And between sampling meatballs as diverse as the chefs who made them, imbibing on wine, beer, champagne and sparkling water, guests were invited to vote on their favorites. Notable standouts included Meatball Obsession who served beef meatballs in their signature paper cups with a healthy coating of their perfectly seasoned tomato sauce, fresh ricotta and mozzarella pearls along with a piece of freshly baked focaccia. The contrast in temperature between the hot meatball and sauce juxtaposed with the cool cheeses made every bite a hearty and yet refreshing experience. And Meatball Obsession’s founder, owner and chef Dan Mancini, brings his grandmother’s recipe to life in such a true and traditional sense that you can actually taste Italy in every bite. The lines around Marco Canora’s Hearth / Terroir station were long and spoke volumes about what was being served, a Meatball Parmesan Hero (albeit slider portion) that was so moist, flavorful and yet light and delicate that they were gone by the time I went back for seconds. Normally too much sauce is the bane of a perfect sandwich, creating a soggy bite, but in this case Canora’s creation made for a surprising eating experience. Watching this masterful chef slice loafs of Italian bread before spooning his delicate meatballs between them, one would expect a more difficult crunchier bite, the kind of bite where you need to open your mouth too wide and consume nothing but bread while the meatball you were going for ends up on your lap instead of in your mouth. Yet with the addition of Canora’s wonderful sauce, a garlic-infused oil and sprinkling of parmesan cheese, the bite was equal parts soft and crunch, and entirely delicious. And then there was Casa Pomona’s Spanish take on albondigas (meatballs). Beef stuffed with braised ox tail meat and served with a salted potato chip was such an original take on the meatball that it made it that much more distinguishable in a room full of meatballs. Swimming in a shallow bowl of tomato sauce, executive chef Jodi Bernhard’s small beef-balls revealed tender oxtail meat at its center that was so perfectly cooked it simply fell apart in your mouth as you bit through the meaty sphere and it made for a mouth-watering explosion of flavor. But there can only be one winner, even if in this case there were two: The people's choice award was bestowed to Chef Donatella Arpaia and her restaurant Donatella. And the judges Anne Burrell, Geoffrey Zakarian and Alex Guarnaschelli awarded the evening’s grand honors to Chef Gabe Thompson who is in the process of opening L’Apicio. It was a night to remember, and everyone was simply... balled over!